Over the past 36 hours I have swam 5,500 meters, ran 6.7 miles, and cycled 17.7 miles all under the roof of my gym. We are experiencing an extreme cold wave here in the Midwest with highs around 15. Running and cycling for me are best done inside. How some people are able to ride outside year round, like All Seasons Cyclist, continue to amaze me. I feel an asthma attack coming at the thought of it. These cold spells usually last a week and then normal cold weather returns with 20’s and 30’s. For those who have spent any time in a cold climate, there are a few things that stir the senses and evoke memories. I went to college in Ann Arbor (yep, Go Blue!) and it would get just as cold. There is a specific sound made walking on snow in below 10 degree temperatures. A unique squeak that at the first sound my mind goes back to Ann Arbor walking across campus to class as the wind blows. My neighbors burn wood in their fireplace all winter long – I love walking outside and taking in the scent of the smoke piping out of the chimney. I can’t help but grin at the peaceful feeling it brings. Beyond sounds and scents, a picture truly is worth a thousand words. Or more. 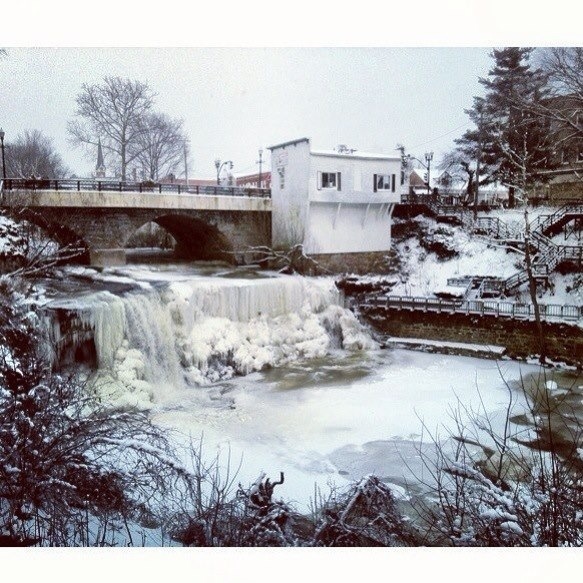 I live on the outskirts of a quaint village called Chagrin Falls. The name of course comes from the Chagrin River that flows through the center of town and is broken in several places by beautiful waterfalls. I enjoy looking at the falls all through the year. The town itself brings memories of simpler times gone by. Today a dear friend of mine took a picture of the partially frozen falls that is beyond words. With all of my training inside, rising before the sun and returning after it sets, I have to remind myself to take in the little things that are so easily overlooked. Joy can be found in any day. From the squeak of the snow, to the scent of wood burning in a fireplace, to viewing the beauty of the frozen winter around me. As I have written before, just look up, look around, listen, and breathe deep. I’m here in Iowa right with you and the picture puts this past week right into perspective. In fact yesterday was my first treadmill run this season! Its strange when we are looking forward to the normal 20-30 degree days so we can head back outside for a run. supposed to be below zero tonight and cold and windy tomorrow, ugh! Try to remember the July heat! Love the picture of the frozen waterfall. Beautiful! Keep warm. Thank you. Wish I could take credit for it, my friend has a good eye.